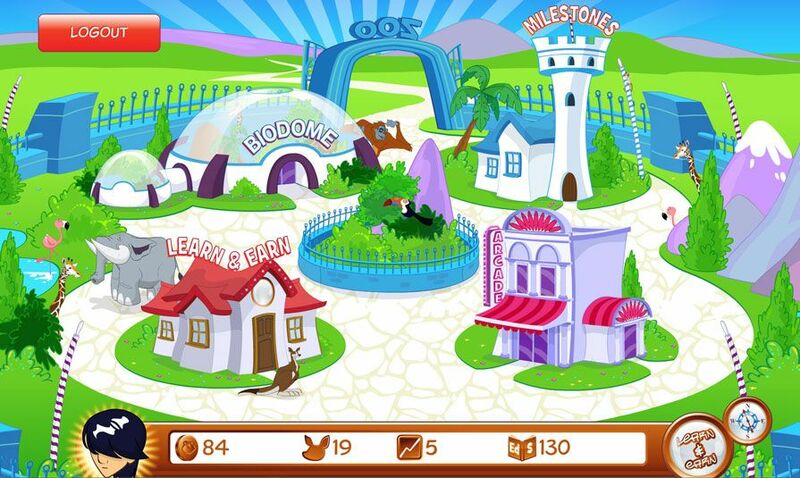 Zoo Whiz is a on-line learning program that is designed for 5-15 year olds to be able to have great fun learning....while they get a chance to create their own zoo. We were able to try out a Premium subscription to this site with A-man, S-girl, L-girl and A-girl....V-girl got to tag along on other peoples adventures. D-man fell into the recommended age range, but after taking one look at the site, basically said, "Uhhh, no thanks, Mom." More on this later. I don't think you will be surprised if I tell you that the games and fun happen at a.....zoo....where your child becomes a zookeeper/zoologist and builds their own zoo. The premium membership allows you to access to certain games and to "buy" certain speciality animals. The premise of the program is by playing educational games in math, reading, word skills, punctuation and grammar.....you then earn coins that you can use to either play arcade games or buy more animals for your zoo. You can play on the site for free, but some of the cooler features and animals are only available with the premium membership. Whichever option you choose, first you create your free parent account and then go from there. You set up free membership accounts for the kids and then, you just choose the upgrade to the Premium membership option. The Biodome is where you can find animals. The Arcade is where you get to play games. The Milestone building is where you can check your progress, but the building they will spend the most time in, is the Learn and Earn house. This is a fun little program. I particularly enjoyed listening to the Aussie accents during the game. Although the kids sometimes had trouble understanding what they were saying. 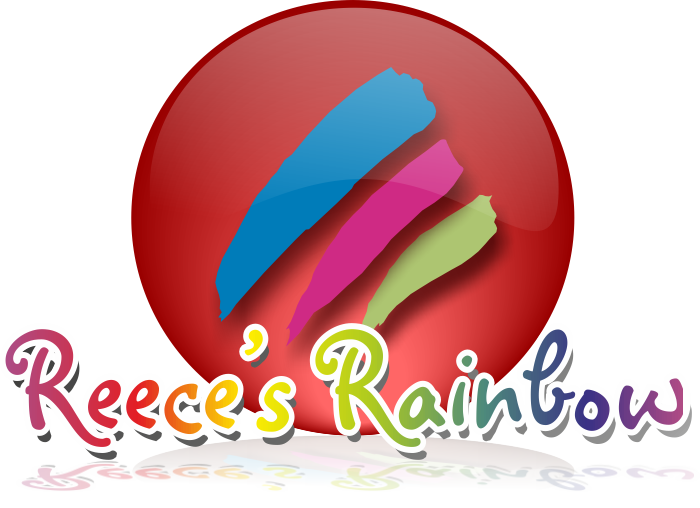 This program really does cover all the subjects mentioned above: math, reading, word skills, punctuation and grammar. Here is a link to take a look at the different educational content for all the different age levels within the game. .....and start playing and learning. 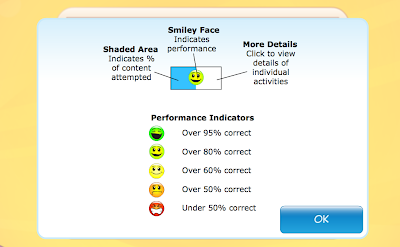 The way you can tell how you are doing is by looking at a chart filled with little smiley faced guys. When I just glanced at them, I misinterpreted the results. I am used to the standard yellow faced, black eyes and mouth guy. So, when I saw a similar one, I assumed that meant that they had done the best. Then I saw a little green faced guy, smiling with his mouth open....and thought that meant they needed improvement. Actually, I was wrong. It was the opposite of that. The green guy means that you are doing the best. There is a chart to explain the smiley's but I didn't find it until I went digging around a bit. 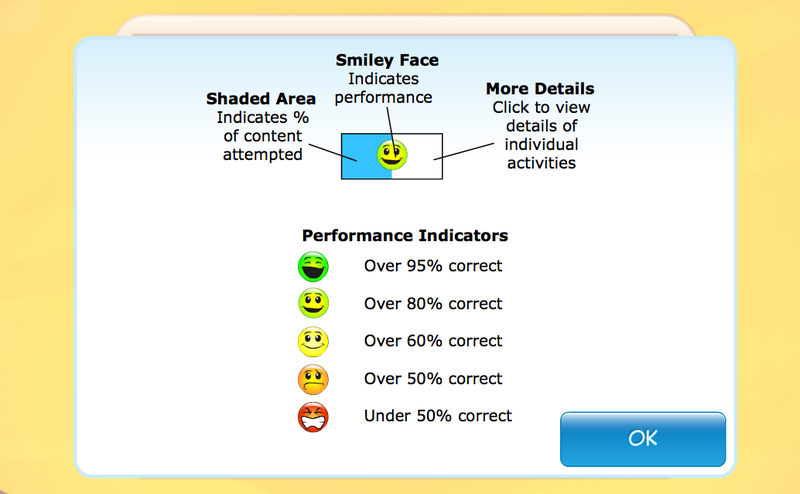 Here is an example of a progress chart that shows all the possible smiley faces.....in action. There are video tutorials available on the site, that explain all these kinds of details and how you can use the whole program. The kids are having fun with this program. I will admit that I have been satisfied that they are learning things when they play on this site, so I haven't been monitoring them as closely as I do when they are on other "just for fun" sites. I mean, I am not letting them have unlimited computer access or anything, but if they ask if they can go on Zoo Whiz....I really don't even limit their time....unless someone else is waiting in the wings for a turn at the computer. Personally, I like the wide variety of problems that they are given within the different areas. They also have a lot of different ways to look at problems...which I think is great....gets the kids thinking and not just blindly answering questions....sometimes they have to think about what is really being asked. There are also quite a few multiple step problems....like, you have to move things around on the page, then type in the answer, and then pick the person who has the most of something. They will get it wrong if they don't go through all the steps and answer all the questions. I like that. 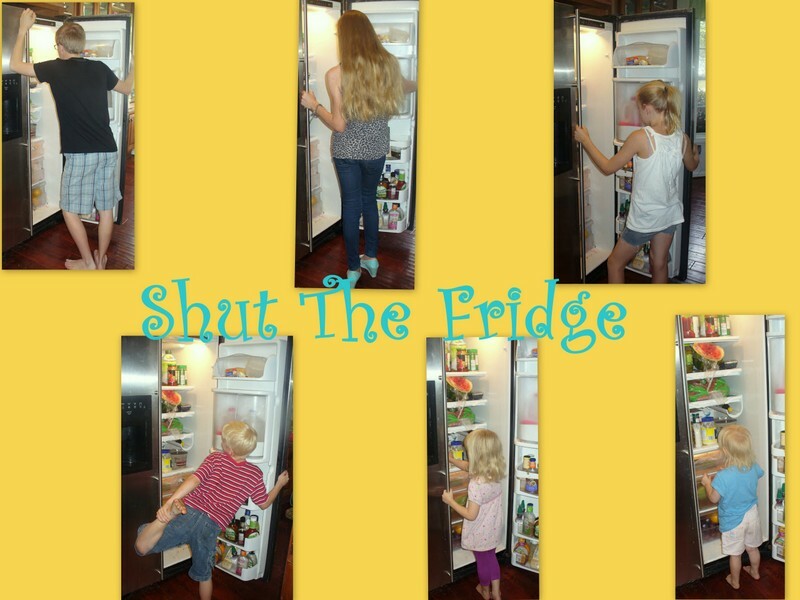 I have certain children who don't like to mess around with little things like details....or reading the directions.....so this is a concrete way to show them that it is good to slow down sometimes and get things right the first time. If they don't get it right the first time, they don't get as many points/coins. One of the features I liked was how easy it was to change their "age floor". For instance, S-girl, has had one of those "light bulb" moments in her reading and math skills.....so suddenly, all of the words and math stuff on her page were too easy. She actually came to me and said it was too easy and asked if we could make it harder. So, we just went in (through my parent account) and upped the age floor and she was challenged again. Another nice feature of the parent account is that you can see what your kids passwords are, in case they forget. Actually, I am much more likely to forget my password than they are...but it is a nice feature. I figured out, that we could also control the type of currency we used or even the spelling for the program.....when things like "colours" and "favourite" showed up. You have the choice to "localize" things like: Australian/British or American spellings, Imperial or Metric units of measure or currencies in $, £ or €. So, if Rainman is ever transferred Down Under....we could set it back to those settings and be good to go, mate. Like I said, my younger kids all liked Zoo Whiz a lot. The graphics are great. The variety of problems is great. The Austrialian accents are "cracker jack". The parent controls and monitoring features are awesome. Now, onto D-man, my 14 year old. Remember, he took one look at the site and very politely declined to take advantage of the chance to build his own zoo? I understand. The game looks very childish. It sounds quite childish. It actually scared me the first few times the kids played it because there were various "jungle" animal sounds that just erupted from the computer. Anyway, however childish the site looked and sounded, there is a lot of more difficult stuff available on the site. But, he and I just couldn't get past the look of this as a kids site. He would help out siblings every now and then....but would not ever spend time on this site on his own. Ever. I think the content is there....but his interest isn't. I am not sure what could be done to make him use the site....well, that isn't true....make it some sort of baseball game and he probably would have jumped at it....cartoons and all. But, D-man aside, the rest of the kids really liked Zoo Whiz. (although A-girl did sort of do the activities to please me - she was in the same boat as D-man....it just seemed to childish). The designers of this site have content that is appropriate and challenging enough for up to age 15. But, I really can't see anyone over the age of 11 or 12 really enjoying this program....because it just doesn't seem like a teenage kind of program....if you know what I mean. It can't hurt for you to try Zoo Whiz for free but, you could just jump in and get started building your zoo with a Premium Membership for $14.95 for 12 months....which is an awesome (wish I could say that in an Aussie accent) limited price option....it used to be $59.95! I am honestly not sure how long the limited pricing option will last, so if this interests you, be sure and take advantage of the cheap pricing now. This is a fun supplemental educational program for your elementary aged kids....whether you homeschool or not. See what other TOS Crew members thought of Zoo Whiz. Maybe some of them were able to get their teenagers to sit down and try this out. Disclaimer: We received a one year Premium membership to Zoo Whiz for free, in exchange for an honest review.